This is one cured product you will almost never see done with wild game; I’m not saying it’s impossible, but to make really good lardo — which is cured and dried back fat — you need that fat to be at least an inch thick. This used to be rare even on domestic hogs, although thankfully with today’s resurgence of heritage pigs, it is no longer so hard to find proper back fat to make lardo. And while it’s not traditional, you can also do this with belly, but again, it needs to be thick. Why make lardo? It is definitely a conversation piece, served over bread on a charcuterie platter. 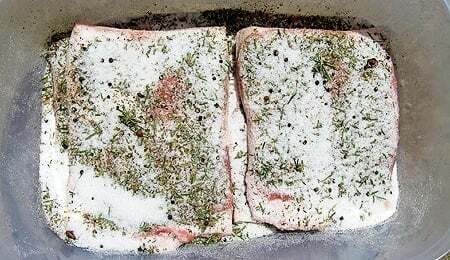 But lardo also works well in any recipe you might want to use English salt pork or French petit salé in — only lardo is better. A few things to remember: Don't bother trying this with a factory pig. They're bred lean and pumped full of nasty hormones and antibiotics, and those things tend to lodge themselves in fats. Go with a small grower who is raising pigs the old way. Farmer's markets are a good place to look. Another thing to remember is that fat hates light. Light can turn pork fat rancid, so cure and hang lardo in the dark. Mix together all the salts and spices. Divide it in half by weight. Massage the mixture into each slab of pork fat, keeping them separated. Vacuum seal each piece with its share of salt and spices. Set the pieces in a container, either stacked or side by side, then put a plate or other lid on them that is smaller than the top of the container. Weigh down this lid with something heavy, like some heavy canned goods. 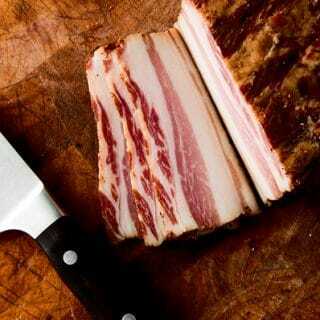 Cure the fat for 12 days, flipping the pork every three days. This helps evenly distribute the cure. After 12 days to 2 weeks, remove the fatback and rinse it well. Pat it dry, then poke a hole about 1/2 inch away from one corner so you can run string through it to hang. 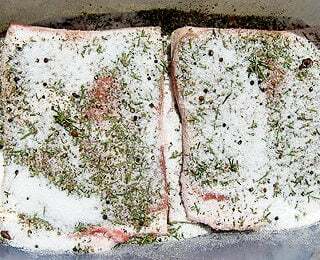 Hang the pork for at least 2 weeks, and preferably 4 to 8 weeks in a dark place that is between 45°F and 60°F, with between 65 and 75 percent humidity. If you are curing other things with your lardo, you might want to wrap the fatback in cheesecloth, and then again loosely with foil. The foil blocks the light when you open the curing fridge door. NOTE: You can leave the fat in the brine that forms far longer than 2 weeks. The Italians leave it for 6 months or more. It will get saltier the longer you leave it. 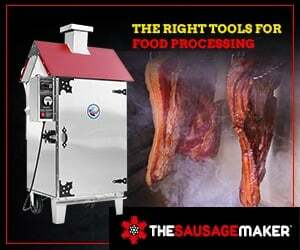 Find all sorts of recipes for bacon, jerky, hams and other cured meats here on Hunter Angler Gardener Cook. Carrie: I think you’re fine. It’s probably a kind of mold. Slice it all away before you serve. Question: I just butchered a hog raised by a friend of mine. I have the leaf lard and I’m not sure what to do with it. Do you think this would be a good use for it? Shannon: Lardo should only be done with a slab of fat off the back of the hog. Leaf lard is from the inside of the paunch, right? I’d render that for pastry lard. I have some super high quality local back fat, but it’s cut in to 2″-3″ square chunks (cubes). Do you think it’s still feasible to make some lardo with these pieces? I have a dedicated chamber for drying. Matthew: That should work. Just cure the biggest pieces.